We know what Krexx can make and what can not. Only one choice this time. 3 DAYS ONLY. After that we will have a winner and then we must set the payment mechanism. Whoa! It's neck-and-neck! Can't wait to see how this turns out. what does the blank female head torso waste look like? I am trying to picture this. anyone? kramer70 wrote: what does the blank female head torso waste look like? I am trying to picture this. anyone? 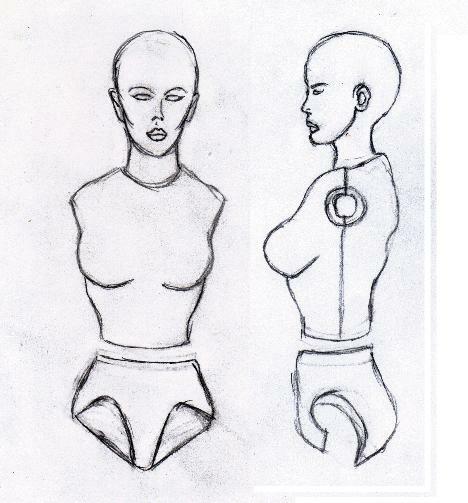 Kramer70 my friend, just for you, here's a picture I just drew and scanned to help you see what a blank female head/torso/ waist might look like, at least to my understanding for the purpose of customizing. This is by no way to scale or anything, this was all done on the fly. Now I have a question.... Cover Girl, Scarlett and Baroness NEW heads with swivel or ball necks? Swivel makes them LBC qualified. Ball necks are more "modern", but there's only the Lady Jaye torso to fit them on. LIVEVIL wrote: Hehehe... nice, Rambo.